"Its easy to make, one bowl and no mess. This has been handed down from my grandmother and I would like to share it with you." Preheat oven to 350 degrees F (175 degrees C). Lightly grease an 8-inch square pan. In a large bowl, combine brown sugar, oats, flour and butter. Mix until crumbly. Place half of crumb mixture in pan. Spread the apples evenly over crumb mixture. Sprinkle with sugar and cinnamon and top with remaining crumb mixture. 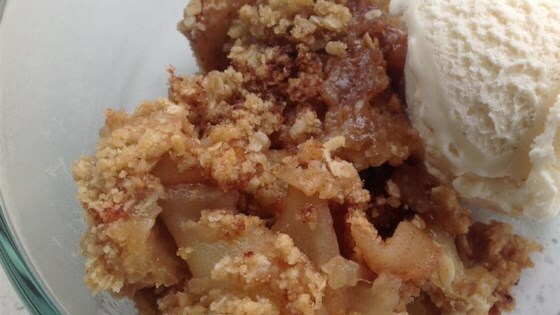 Oatmeal Apple Crisp To Die For! I followed this recipe exactly and it turned out very dry, so dry in fact we were unable to eat it. The oatmeal mix remained powdery. I would not attempt this one again!